The Orthodontic Clinic is proud to offer the Enlighten revolutionary tooth whitening treatment. 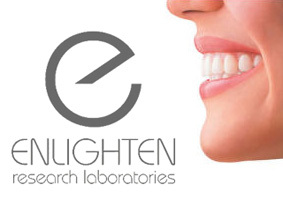 As an accredited Enlighten tooth whitening centre, we recommend Enlighten's Evolution professional teeth whitening treatment as it is the only system in the world that will whiten up to 16 shades easily and safely and will give you a dramatic look. With Evolution there is absolutely no need for any gum protection so it can deliver a great result every time, but it is safer and easier to use. You will need to first have some impressions which will be sent to the Enlighten laboratory who will then make high quality sealed bleaching trays for you. This usually takes about two weeks. During this time you will need to use their amazing toothpaste called Tooth Serum twice a day instead of your regular toothpaste. This is no ordinary toothpaste. It contains a material called Hydroxyapatite (HAP) which is what your Enamel is made of (97% of it in fact).This HAP will not only improve the whitening effect but it will also protect your teeth and reduce and sensitivity. Next you will come back to pick up the bleaching trays and your home whitening kit. You will then need to whiten your teeth at home every night for two weeks, ensuring that you keep using the Tooth Serum twice a day. Finally you will return once more to us for a 40 minute treatment in the surgery. Make sure you bring your whitening trays with you. This final treatment will not only boost the colour a little but will ensure the whitening is even and natural looking and help the colour to be more stable i.e. the whitening will last longer. The good news is that now you can keep your teeth white forever! By keeping your trays safe and purchasing more home gel from us, you can top up every now and then. We recommend you wear your trays one night every two or three months to keep your teeth at their optimum whitening level. For added benefit you can use the Tooth serum - this will help maintain the colour and protect your teeth. You can purchase more from us if you wish.